"Genessee Falls Near Portage N.Y."
This remarkable image probably pre-dates Mr. Letchworth first glimpse of the Portage area that would become his home. The image is similar to Image 122, but you will notice that the main mill is still standing. Another view of the mill can be seen in Image 1. 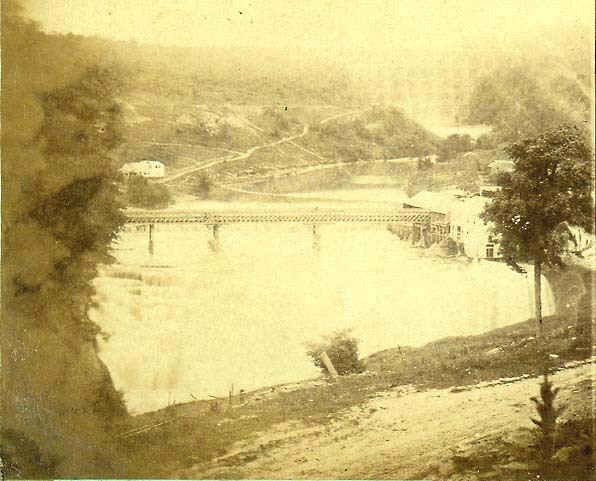 When the image was taken, the Genesee Valley Canal was in the final stages of construction, and the Portage Bridge, seen in the background, was only a few years old.